Another month, and my only North Wales pictures have already been seen on the Pwllheli page, so time for another tenuous link. This is Class 52 Western D1015 Western Champion, withdrawn from service and stored round the back of Swindon Works. Unlike the many other Westerns in similar condition on that site on that day, D1015 was to be preserved, and this year became the first Western to work along the North Wales coast line. Swindon works was one of the principal scrapping locations for BR locos in the mid 1970s, and many Westerns and Class 24s ended their careers here. 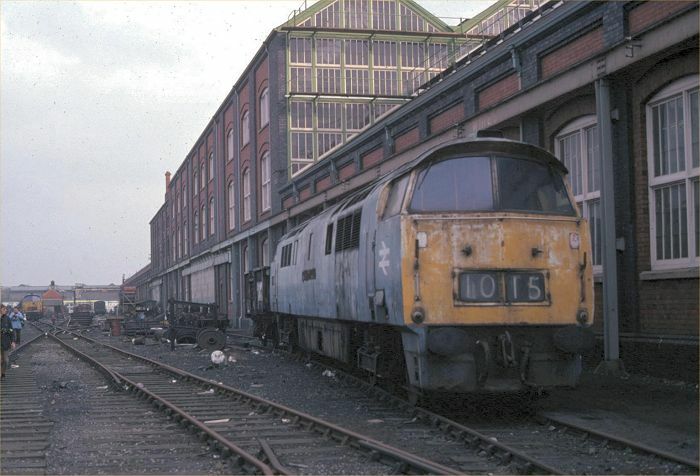 On the 11th of November 1978, there were still 14 Westerns present, of which only D1015 and D1041 were to survive. Many Crewe 24's were taken here and cut up in 1976 and 1977, but by this date only 24084 remained - possibly the last 24 cut up here - which was disposed of by the end of the month.